The gravel vacuum has been around a long time and is an essential piece of equipment for hobbyist that are still using Under Gravel (UG) filtration. The gravel vacuum is the best way to remove trapped detritus from the gravel beds of aquariums using UG filtration. 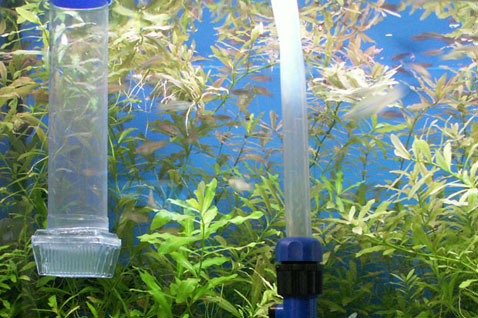 Today in the modern aquarium which does not use a UG filter a gravel vacuum can cause detrimental effects that include removing beneficial organisms, disruption of the ecological balance of the bed, spikes in the ammonia and nitrite, and death of your fish a few days after the cleaning. I will go into little detail about the sand bed and the overall importance it plays in the health of the aquarium ecosystem. In order for these two distinct layers to exist in the sand bed you need to have fine sand two (2) inches or more in depth, and organisms that can help with the slow exchange of water through the bed. The sand bed needs to be deep enough to allow aerobic bacteria (Nitrosopira/Nitrospira) and other organisms to use up the oxygen before it reaches the deeper layer of the bed. For this reason you need a fine sand, as gravel would allow to quickly of an exchange of water thus making it much more difficult to develop the anaerobic layer. Although it is possible to have a anaerobic layer with gravel, it would take 6 to 12 inches to achieve this goal. Now what kind of organisms help with NNR? In saltwater, there are many types of tube worms, snails, and other bugs that help with the slow exchange of water through the bed. 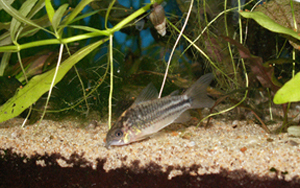 In freshwater, there are snails (Malaysian Livebearing Snail), fish like cory cats and loaches, worms (California Black Worms/Tubifex worms), and other bugs. As you can see the sand bed is a very diverse eco-system with all organisms interdependent of one another to keep the aquarium water chemistry safe for your aquarium inhabitants. 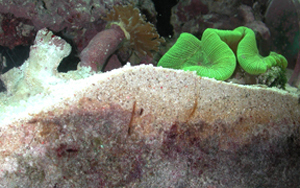 The photo to the left shows a deep sand bed in a saltwater aquarium. Notice the tubes in the sand. These tubes are formed by spaghetti worms that filter the water column. When these worms move up and down the tube they help exchange water in the sand bed. The photo on the right shows a Corydoras bilineatus (San Juan Cory) and a Malaysian Livebearing Snail in a freshwater aquarium with #60 natural sand as a substrate. Now that the sand bed is well established, here comes the gravel vacuum. STOOOOOP!!! The gravel vacuum should only be used to pull off detritus that may be laying on top of the sand bed. If you shove the gravel vacuum into the sand or gravel of an aquarium that does not use a UG filter you will be pulling out beneficial organisms, disrupting your anaerobic layer, and worst of all your heavily colonized aerobic top layer will no longer be heavily colonized with aerobic bacteria. When a aquarium that does not use a UG filter is gravel vacuumed it is common within a few days that ammonia and nitrite to silently creep up. Since your aerobic bacteria population that is in contact with the water column has been significantly reduced your ammonia and nitrite (more commonly nitrite) can reach toxic levels. Three to five days after such a cleaning hobbyist start loosing fish. When ammonia and/or nitrite reach toxic levels you need to do a 90% water change to reduce the ammonia and nitrite concentrations down to an acceptable level for your fish. It could take weeks for your aquarium's ecosystem to recover from such a cleaning, so you will need to test your water for ammonia and nitrite every couple of days, and lighten the feeding until the ammonia and nitrite levels return to 0 ppm.